It's officially summer! Lets buy cold things on sticks, preferably luxury ones. The brand leader in this has recently always been Magnum, after the Cornettos got smaller and less exciting. Now there are a few more contenders to the throne. Here we see the playful curves of a Haagen Dazs version of the Magnum almond, and the Magnum caramel all rolled into one. 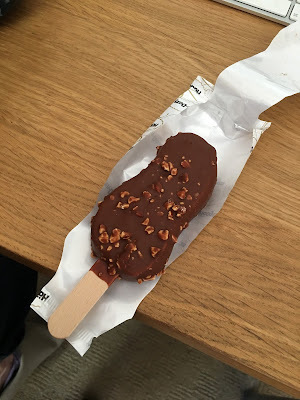 If the Magnum Infinity hadn't looked like this then this would be a cool move so that people in the street know what you are eating. 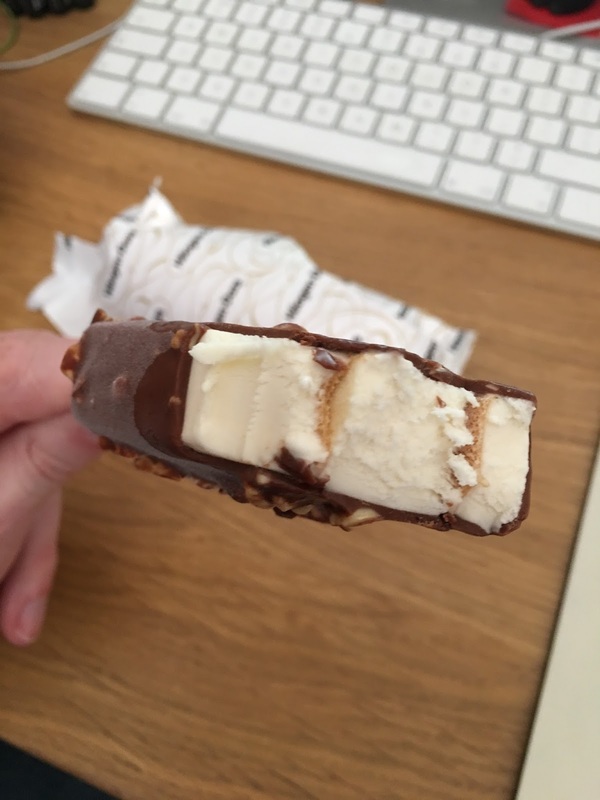 I do put most of Magnum's success down to making sure that others know what you just bought from the ice-cream man. Pink and shiny ftw. 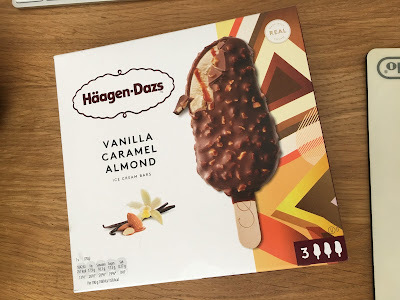 That said, Haagen Dazs do make some pretty good plain ice-cream and so as you'd expect all the bites that have no choc caramel or almond in are actually creamy and great. At the top the caramel is not really in force, but as you eat down the swirls intensify changing the flavour as it goes - which is really smart. The almonds are decently large without making the bites too awkwardly hard, and the caramel is surprisingly gentle but with a lovely deeply sweet flavour. So it's not that innovative and different I guess but as the caramel and almonds taste very real and not artificial the whole thing is quite a nice luxury ice-cream to hide away with. A top quality snack indeed.